Bioquell’s unique Hydrogen Peroxide Vapour technology is proven to eradicate any and all bacteria, viruses, fungi, spores and more. 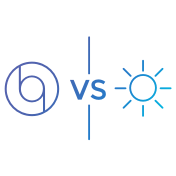 The efficacy of our technology has been tested in numerous applications, in both controlled and clinical studies. The results showcase an unmatched level of effectiveness spanning every exposed surface of an enclosed area, providing leading infection prevention advantages for healthcare facilities around the globe. Achieve safe, fast, efficient, residue-free decontamination with Bioquell Hydrogen Peroxide Vapour in these easy steps. Quickly prep the room for decontamination: vents sealed, linens removed, and cabinets and drawers opened. After placing the system and aeration units in the room. Close and seal the door upon exiting. Just press the green button to start the automated process. The Bioquell BQ-50 warms up and emits vapour onto every exposed surface, including in any adjacent bathrooms, sluices, store rooms etc. 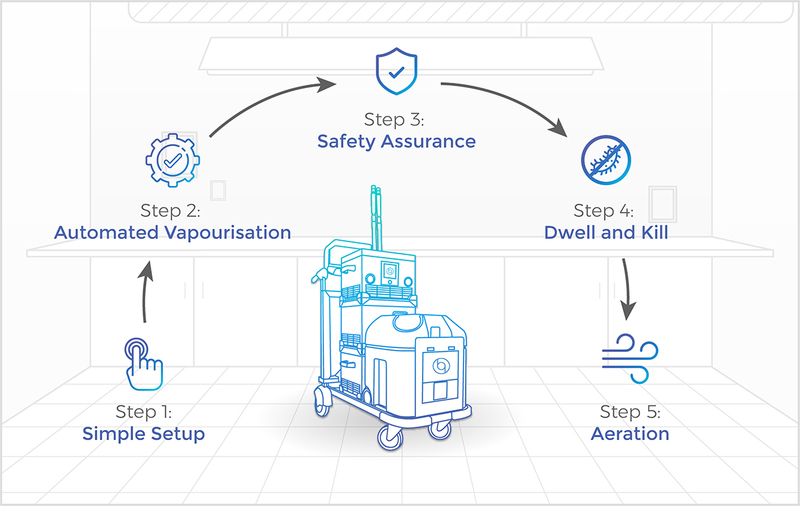 Once vapourisation begins, the user checks the door to the room to ensure no leaks occur with the included handheld monitor. Leaks are incredibly rare as our process is not a pressurised one, and can be covered simply with Bioquell adhesive tape. With vapourisation now complete, the enclosed area is at a standstill, allowing the peroxide to dwell on every exposed surface to eradicate pathogens. Most micro-organisms are long gone by this point, but this effort ensures high efficacy against particularly tough organisms, like C. diff spores. Aeration units kick on automatically to rapidly convert the Hydrogen Peroxide Vapour in to water vapour and oxygen, leaving no residue and no further cleanup required. The room is then safe for immediate patient reoccupation. 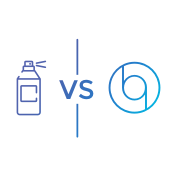 Bioquell’s Hydrogen Peroxide Vapour systems and services eliminate 99.9999% of pathogens for a 6-log kill with our 35% hydrogen peroxide solution. The process provides complete coverage on every exposed surface while remaining residue free, proven safe on sensitive electronics and shown to kill a wide range of microorganisms. By using our Hydrogen Peroxide with a Bioquell system or service, you achieve even more than complete surface decontamination. You can also ensure complete compliance to the laws and regulations within your country and other nations around the world. We are Biocidal Products Regulation compliant and EPA registered as a sterilant.